To load Google Visualization AJAX API. var chart = new google.visualization.PieChart(document. Google package name imagepiechart to use to display chart below style. var chart = new google.visualization.ImagePieChart(document. Thanks very much! how do I use it offline? Are they also suitable for blogs at blogspot.com? can we use it offline ? Thanks. Any ideas why it's soooo slow in IE?? Sir can you please show to us how to use it with php, make the values dynamic. thanks. 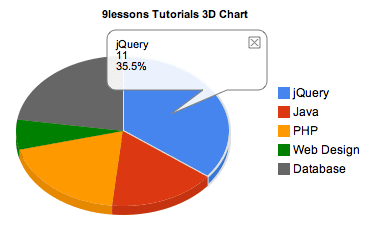 MySQL in PHP & use the Google Visualization API to draw chart Dynamically. // now all the usernames are stored in the array to output this to the chart do this.